Stumbled on this book at the wonderful bookstore at the Minnesota State Hortcultural Society’s offices in St. Paul. Finally! Someone put it all into one inexpensive book. And you will find it all. All those lists of annuals that deer hate, perennials that deer hate, vegetables that deer hate (plus lists of all the plants deer love). Plus sections on identifying deer damage, how to make and use your own homemade deterrents, selecting commercial deterrents, and designing a landscape that repels deer. This is it. 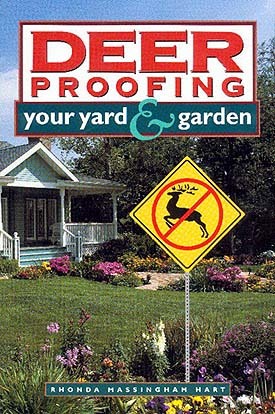 There is nothing to know about deer proofing that isn’t in this book. Hart has a nice, light, friendly tone, and the publisher has included clear illustrations that serve the prose well. No more two-page e-mail replies from me when I get asked the dreaded deer question! Just a quick note to go out and buy this book.